Very popular in pine wood, the Amish Pine Jelly Cabinet with Drawer offers a great storage solution wherever you need it. Dress up an area in any room with this handy storage. It offers one drawer and one shelf within the cabinet. 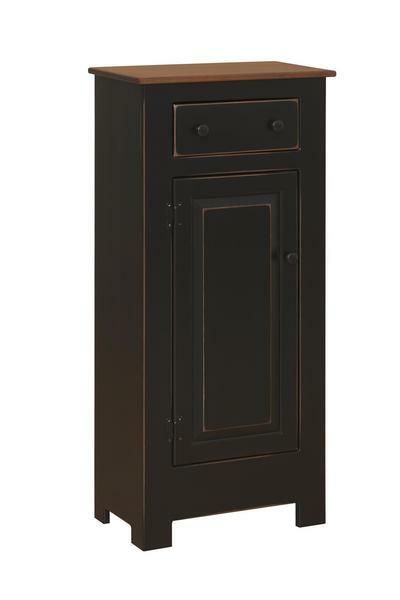 The Amish Pine Jelly Cabinet with Drawer is shown here with a primitive black painted base and special walnut stained top. Pine wood loves country style and wears stain, paint or distressed options well. Picture this sweet jelly cabinet helping you in the kitchen or adding cozy cottage style in the bathroom. Our solid pine furniture is offered at a delightful price. It is softer than other hardwoods, but provides strength and stability you can count on. Please email or call us with any questions about our pine furniture and jelly cabinets. Thank you for visiting. I received my jelly cabinet today, and it is so beautiful. I am more than pleased with it, and was quite impressed by the packaging. There was so much plastic and bubble wrap, the finish on the cupboard is in perfect condition. I'm glad I shopped with you and will be back.